Women in Politics in the U.S.
A woman works in an office at NASA. In 1990, close to 2 million women worked as secretaries and other clerical workers. About one-fourth to one-third of women from each ethnic group in the United States are clerical workers. 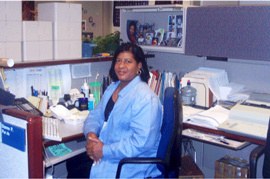 Since many female clerical workers serve as assistants to male managers, they are sometimes treated as “office wives.” Many of the duties of these female clerical workers are entry-level simple tasks which do not require much training, such as word processing and data entry, which makes it hard for them to advance in the work place. In 2002, 81.42% of the clerical work force of the federal government was female. This is a slight decrease since 1993, when the percentage was 85.98%. Among these female clerical workers, the percentage of white women is decreasing but that of women of color is increasing. Click CHARTS to see the clerical work force in government wide employment of workers.